Smoothens and tones the skin. An exfoliating scrub with finely milled Walnuts in a pure Aloe Vera and vitamin A and E packed gel base. While the Aloe Vera and Vitamins stimulate cell regeneration, the oil rich Walnut has a deep cleansing action which brightens the complexion by gently removing dead cells and impurities. 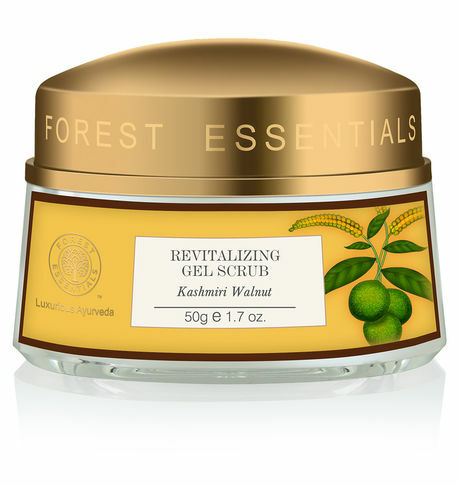 This Revitalising Kashmiri Walnut Gel Scrub has been formulated with a distinctive combination of high quality Kashmiri Walnuts with selected herbs like Agneemanth and Kachoor. Millled Walnut possesses excellent exfoliating properties which removes dead and damaged skin cells and smoothens and tones the skin. This combination has been used to provide nourishment and improve overall skin texture, giving a healthy glow.